Mix laydown involves everything used to place the delivered HMA on the desired surface at the desired thickness. 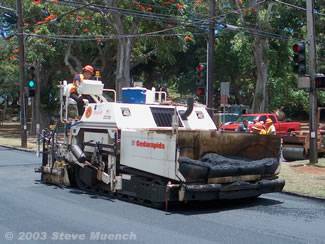 The asphalt paver is the principal machine involved in mix laydown and is assisted by the material transfer vehicle (MTV) in some instances. Lift thickness. 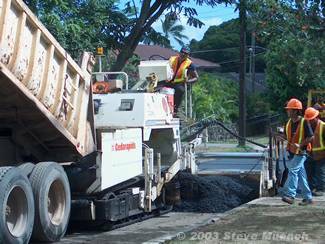 A “lift” refers to a layer of pavement as placed by the asphalt paver. In order to avoid mat tearing (which generally shows up as a series of longitudinal streaks) a good rule-of-thumb is that the depth of the compacted lift should be at least twice the maximum aggregate size and three times the nominal maximum aggregate size (TRB, 2000). Overly thick final lifts have a tendency to shove or displace during compaction making it difficult to achieve a smooth finish. Longitudinal joints. The interface between two adjacent and parallel HMA mats. Improperly constructed longitudinal joints can cause premature deterioration of multilane HMA pavements in the form of cracking and raveling. Place the HMA in a pile far enough away from the placement area that the whole pile must be moved. If the pile is located in the placement area its appearance, density or aggregate distribution may be slightly different than the surrounding handworked mat. Carefully deposit the material with shovels and then spread with lutes. Do not broadcast (scoop and pitch) the HMA with shovels – this is likely to cause aggregate segregation. All material should be thoroughly loosened and evenly distributed. Chunks of HMA that do not easily break apart should be removed and discarded. Check the handworked surface with a straightedge or template before rolling to ensure uniformity. Tractor. The tractor contains the material feed system, which accepts the HMA at the front of the paver, moves it to the rear and spreads it out to the desired width in preparation for screed leveling and compaction. The tractor moves using rubber tires (see Figures 1 and 2) or tracks (see Figure 3). Screed. 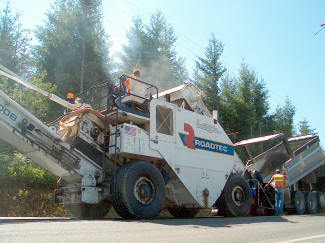 The most critical feature of the paver is the self-leveling screed unit, which determines the profile of the HMA being placed (Roberts et al., 1996). The screed takes the head of HMA from the material delivery system, strikes it off at the correct thickness and provides initial mat compaction. Figure 5 shows screed components and the six basic forces that act upon the screed to determine its height and, thus, pavement thickness. Figure 5. Screed components and forces. Paver speed. If a paver speeds up and all other forces on the screed remain constant, the screed angle decreases to restore equilibrium, which decreases mat thickness (think of what happens to the ski angle of a water skier as boat speed increases). Material head. If the material head (the amount of material in front of the screed) increases (either due to an increase in material feed rate or a reduction in paver speed), screed angle will increase to restore equilibrium, which increases mat thickness. Tow point elevation. As the tow point rises in elevation, the screed angle increases, resulting in a thicker mat. As a rule-of-thumb, a 1-inch movement in tow point elevation translates to about a 0.125 inch movement in the screed’s leading edge. Without automatic screed control, tow point elevation will change as tractor elevation changes due to roughness in the surface over which it drives. Locating the screed tow point near the middle of the tractor significantly reduces the transmission of small elevation changes in the front and rear of the tractor to the screed. Because the screed elevation responds slowly to changes in screed angle, the paver naturally places a thinner mat over high points in the existing surface and a thicker mat over low points in the existing surface (TRB, 2000). Screed angle can also be adjusted manually by using a thickness control screw or depth crank. Screed angle adjustments do not immediately change mat thickness but rather require a finite amount of time and tow distance to take effect. Figure 6 shows that it typically takes five tow lengths (the length between the tow point and the screed) after a desired level is input for a screed to arrive at the new level. Because of this screed reaction time, a screed operator who constantly adjusts screed level to produce a desired mat thickness will actually produce an excessively wavy, unsmooth pavement. Erected stringline. This consists of stringline erected to specified elevations that are independent of existing ground elevation (see Figure 7). Most often this is done using a survey crew and a detailed elevation/grade plan. Although the stringline method provides the correct elevation (to within surveying and erecting tolerances), stringlines are fragile and easily broken, knocked over or inadvertently misaligned. Lasers can be used to overcome the difficulties associated with stringlines because they do not require any fragile material near the pavement construction area. Lasers can establish multiple elevation or grade planes even in dusty or high-electronic and light-noise areas and are therefore sometimes used to construct near-constant elevation airport runways. 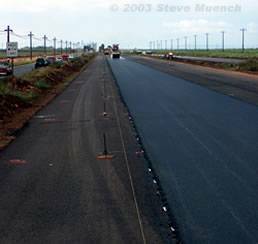 Even the laser method becomes quite complicated, however, when frequent pavement grade changes are required. Mobile reference. 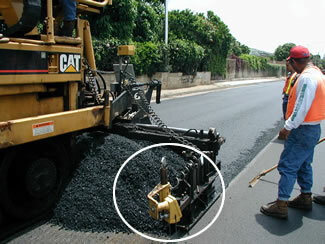 This consists of a reference system that travels with the paver such as a long beam or tube attached to the paver (called a “contact” device since it actually touches the road) or an ultrasonic device (called a “non-contact” device since it relies on ultrasonic pulses and not physical contact to determine road elevation – see Figure 8). The mobile reference system averages the effect of deviations in the existing pavement surface over a distance greater that the wheelbase of the tractor unit. Minimum ski length for a contact device is normally about 25 ft. with typical ski lengths being on the order of 40 to 60 ft. (Asphalt Institute, 2001). Joint matching shoe. This usually consists of a small shoe or ski attached to the paver that slides on an existing surface (such as a curb) near the paver. Ultra sonic sensors accomplish the same task without touching the existing surface by using sound pulses to determine elevation. This type of grade control results in the paver duplicating the reference surface on which the shoe or ski is placed or ultra sonic sensor is aimed. 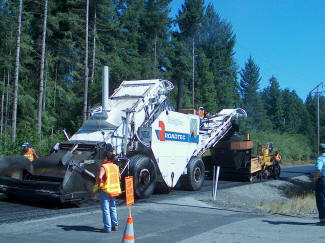 Material transfer vehicles (MTVs) are used to assist the paver in accepting HMA. Most pavers are equipped to receive HMA directly from end dump or live bottom trucks, however in certain situations it can be necessary or advantageous to use an MTV. Paving using bottom dump trucks and windrows requires a windrow elevator MTV, while other MTVs are used to provide additional surge volume, which is advantageous because it allows the paver to operate continuously without stopping, minimizes truck waiting time at the paving site and may minimize aggregate segregation and temperature differentials (see Figures 9 and 10).